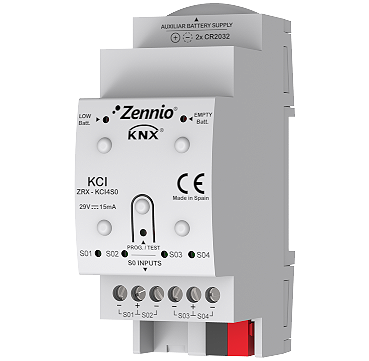 KNX Consumption Interface (KCI) is the Zennio KNX interface for four consumption meters with S0-pulse outputs to monitor their electricity (energy and power), water and/or gas (volume and flow rate) consumption measure in the KNX bus. A removable battery allows buffering S0 pulses during a KNX power failure and recovers the real consumption afterwards. LED indicators make the user able to check the existence of communication through each S0 channel, as well as the battery status (low battery and/or run out of battery), which is also indicated in the KNX bus. DIN rail mounting device (2 DIN rail units).